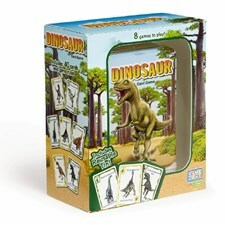 Dinosaur fans will have fun naming the 10 different dinosaurs depicted on these playing cards. Play 8 fun and challenging games: Digging up dinosaurs, Dinosaur Duo, Double Dinosaur, Dinosaur Snap, Dinosaur Match-up, Dinosaur Rummy, Advanced Rummy and Fishin’ for Dinos. Contains 40 cards and game rules. Category: Puzzles, Games & Kits.